THE past six years have been hard for local steel players largely due to China flooding the regional market with its products. While the downstream players were not as badly hit as those in the upstream segment, margins have been squeezed across the board. 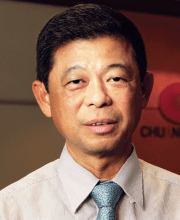 For Chuan Huat Resources Bhd (fundamental: 0.9; valuation: 2.4), the solution is to focus more on providing value-added services and products than on its traditional steel stockist operation where the profit margin is thin. In fact, the group plans to set up three new plants by 2016 to expand capacity for its cut and bend services and the production of steel reinforcement mesh. “We want to expand our steel service centre and we notice that the demand for reinforcement mesh is strong,” deputy managing director Datuk Mark Lim tells The Edge. He says Chuan Huat will increase the production capacity of its steel service centre by 67% — from 6,000 tonnes to about 10,000 tonnes per month — once the three plants start operating early next year as planned. “The expansion should see a double-digit increase in our revenue from this division,” he adds. In the financial year ended Dec 31, 2014 (FY2014), the steel service centre contributed about 15% to group revenue of RM708.7 million. Trading in hardware and building materials, of which the steel service centre is a part, accounted for 92% of total revenue. “While trading [in hardware and building materials] is our core business, we are now focusing on cut and bend services and steel reinforcement mesh. We’re heading in that direction,” Lim explains. Acknowledging that there will be some cannibalisation of the trading side, he says the value-added services will give Chuan Huat better margins. In the fourth quarter of FY2014, the group posted a net loss of RM935,000 compared with a net profit of RM1.63 million a year ago while revenue came in 1.5% higher at RM181.83 million. Net profit rose to RM21.34 million from RM9.41 million previously but largely due to a fair value gain on investment property of RM18.68 million. Revenue of RM708.7 million was 2.2% higher year on year. Part of the services Chuan Huat provides is to cut and bend steel bars to builders’ specifications. According to Lim, this service has grown increasingly popular with railway builders, who want the convenience and speed that comes with ready-cut and bent bars instead of buying standard length bars and cutting the bars at the project sites. “Contractors are now looking for value-added services. The cut and bend service has been in the market for a long time, but demand is stronger now because of the ongoing building and infrastructure projects,” he explains, citing the government’s huge allocation to improve public infrastructure and the transport system, especially the MRT and LRT extension projects. Besides its steel business, Chuan Huat is also a distributor of printing consumables. It supplies computer hardware, software accessories and related services via ACE Market-listed Pineapple Resources Bhd, its 63.85%-owned subsidiary. In FY2014, the trading of IT-related products contributed RM74.2 million to Chuan Huat’s total revenue. It currently has 30 retail outlets nationwide selling more than 1,000 products. “Competition is stiff on the retail side but we see a lot of growth in e-commerce. While [online sales] only make up 5% of our total turnover, it should grow to at least 20% within three years,” Lim says, adding that any impact from the Goods and Services Tax will be short term in nature. Chuan Huat closed at 56 sen last Thursday, giving it a market capitalisation of RM93.6 million. Note: The Edge Research’s fundamental score reflects a company’s profitability and balance sheet strength, calculated based on historical numbers. The valuation score determines if a stock is attractively valued or not, also based on historical numbers. A score of 3 suggests strong fundamentals and attractive valuations. Go to www.theedgemarkets.com for more details on a company's financial dashboard.